Excerpt below. Read the full article from the Fred Hutch News Service or Download and Share a printable .pdf. The first time Leigh Pate heard the term was when she got a phone call from her doctor following a series of diagnostic tests. The mammogram had been clean — like so many before it — but the ultrasound and biopsy told another story. Pate went through two surgeries; five months of chemotherapy; 33 courses of radiation and four years of tamoxifen, a daily pill that cuts off the fuel source for this very estrogen receptor-positive (ER+) disease. 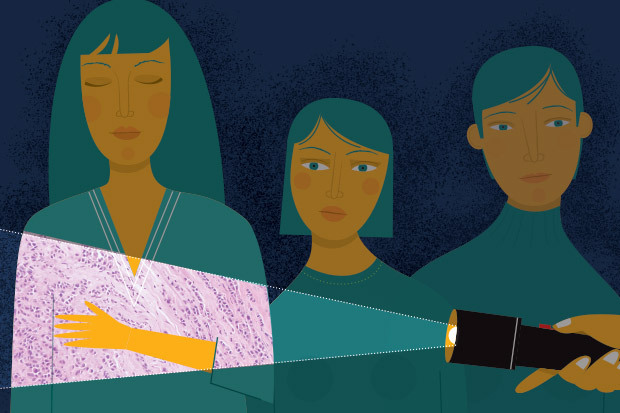 By the end of her treatment and recovery, she not only knew what lobular breast cancer was, she was determined to shine a spotlight on this idiosyncratic subtype. Patients like Pate aren’t the only ones pushing for more lobular research. President and executive director of Seattle Cancer Care Alliance and head of medical oncology at the University of Washington, Davidson was the powerhouse who built University of Pittsburgh’s strong lobular research program before joining Fred Hutch. “Although superficially we think of lobular and ductal as the same, and treat them interchangeably, they might have biological differences that would have clinical differences,” she said. Lobular, it would seem, is finally having its day.